Some people like freckles. Some people hate them. Many people think they’re cute – on somebody else – and want to get rid of their own freckles. What are freckles? Freckles are groups of skin cells (keratinocytes) that contain melanin, the brown skin pigment. The skin cells are otherwise perfectly normal, so the spots are flat and cannot be felt. They do not cause a lump. The melanin is produced by a specialized cell called a melanocyte. Exposure to sunlight stimulates the melanocyte to increase the amount of melanin it makes and the pigment seeps out and is picked up by the surrounding skin cells. That’s why the color appears in spots, instead of uniformly across the skin. Don’t worry though, as there are ways to reduce melanin in skin. Areas that lack melanocytes do not freckle. Since people generally get more sun exposure in the summer, they tend to freckle more at that time. During the winter the spots may disappear entirely. They also tend to disappear as we age. Light skinned people generally get more freckles than people with darker complexions. Redheads and blondes are the most freckle prone. But if your parents had freckles, then you are going to have them, too. 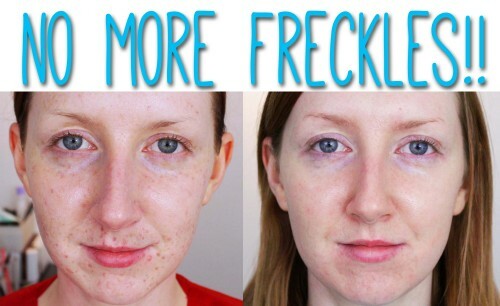 This is probably the most effective way to eliminate freckles. Protect your skin from the sun. Wear hats with wide brims so your face is in shadow and wear long sleeved shirts and long pants. It’s not just your face you need to protect. Try to avoid going outside when the sun is high in the sky since this is the time when you get the most uv radiation. If you must go out, try to stay in the shade as much as possible. And wear sunscreens with SPF 50 – all the time, every time. Lemon juice is one of the best natural bleaches. The citric acid in the juice lightens the skin. Using the juice from fresh squeezed lemons or the pre-squeezed variety you can buy in a bottle, gently apply the juice onto the freckled areas. Be very careful to keep the juice out of your eyes. Leave the juice on for ten to fifteen minutes and then wash off with warm water. You will have to do this twice a day for several weeks before the freckles disappear. Horseradish and onion juice are also lightening agents, but less pleasant to use. You can rub slices of red onion on the freckled areas daily. All of these treatments can cause skin irritation. If your face turns red and burns after a treatment, stop using that method. Sour cream contains lactic acid, which a very gentle peeling agent. Apply the sour cream to the freckled areas like a mask and leave it on for ten to fifteen minutes. Then wipe it off with a soft cloth and rinse with cool water. Repeat this daily for several weeks. You can also use mashed strawberries and kiwi or cucumbers for a facial mask that will cause a peel. The natural agents in the fruit are very gentle to the skin. The layer of skin underneath will be lighter in color. Banana mashed with mint leaves provides you with salicylic acid in the banana, which gives you a natural peel. B vitamins and folate in the mint are lightening agents and in addition, mint contains antioxidants and vitamins C and A, providing extra nutrition for your skin. Honey is a humectant, a substance that holds water and adds moisture to whatever it is applied. It also contains enzymes that are natural lightening agents. 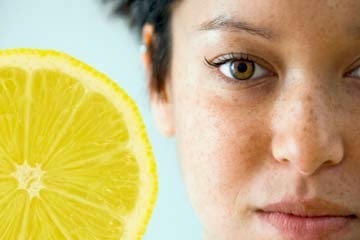 Combined with lemon juice, this is a very effective method to get rid of freckles permanently. If you mix the honey and lemon with wheat germ, you can make a paste that you leave on for fifteen minutes, then rinse off with cool water. The honey method should be used every other day. Hide the freckles by darkening the skin in between them naturally. Castor oil, that old home remedy for everything from constipation to upset stomach, is excellent for adding a light tan color to the skin. It’s harmless, so you can apply it to your face at night before bed and wash it off in the morning. Only a few applications will get rid of freckles quickly. Vitamin E oil not only fades freckles fast, it contains nutrients that seep into your skin and keep it healthy. Like castor oil, you can apply it at bedtime and leave it on overnight. Wash it off in the morning and watch your face glow. Sake, a Japanese wine made from rice, contains kojic acid, which inhibits the production of melanin in the skin. This causes the freckles to fade away fast, since skin cell turnover rate is about three weeks. In other words, new skin cells from the lowest layer of the skin replace the ones in the layers above them until they die and are sloughed off in a few weeks. If you can prevent the lowest layer of cells from picking up a lot of melanin, the freckles will be gone soon. Mixing the sake with honey, yogurt and oatmeal powder produces a paste that you can apply and leave on for about 30 minutes. Then wash off. The antioxidants in the paste are good for your skin as well. Vitamin C (citric acid) in your diet helps lighten your skin, just as it does when you apply it to your face. If your skin is too sensitive for lemon juice, then make sure you eat a lot of citrus fruit. Other foods that contain a lot of vitamin C are kiwi, tomatoes, bell peppers, berries and papayas. Over-the-counter skin whitening creams containing hydroquinone and oxybenzone are very effective but they are also very likely to cause damage to the skin. Natural ingredients such as bearberry, aloe, mulberry, kojic acid, licorice extract and other herbs are soothing to the skin and lighten the freckles without danger. Look at the ingredients when you buy and make sure that there are no precautions listed. And use the creams as directed. I’ve found the Skin Whitening Cream from NioSkin to be beautiful on the skin, and not cause any damage. Since skin turnover takes several weeks, there is no way to get rid of freckles overnight. But there are many quick, natural and safe methods to eliminate those pesky spots from your nose. If you develop any reaction to these natural remedies, stop the treatment immediately and consult your doctor. While natural ingredients generally are safe, some people can be sensitive to them. If you’re allergic to citrus or kiwis or papayas, don’t put them on your skin. Don’t be in a rush to eliminate those harmless spots. Protect your skin and be safe.